A structured network cabling installation can be placed in almost any building from industrial units, offices and commercial premises to educational establishments (Schools, Colleges, University, Training Suites). Whether you are a charity requiring a handful of network points or a large organisation located over several sites we will always offer a solution to suit your requirements, budget and planned future expansion. 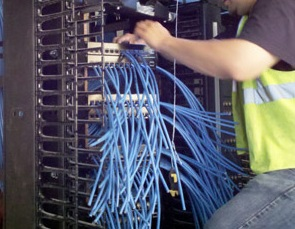 If you’re experiencing problems with an existing network we can test, repair and re-certify your cabling. Network cabling installations are usually overlooked when hardware and software upgrades are implemented and in many cases it is a failure within the network cabling that is the cause of slow performance. It’s much simpler and cheaper to check and fix your network cabling installation than it is to invest in new servers and desktops. If you would like more information about our network cabling installation services please get in touch using our contact form or give us a call on 0845 319 4887*. Prior to the commencement of any installation, comprehensive surveys and enquiries are made to ensure that what is installed covers your current and expected future requirements. Whatever the size of your network our design and implementation process is the same, ensuring that you have a system which meets your needs. As 75% of network faults are due to cabling not being tested properly during installation we provide all our structured cabling installations with a full test report, guarantee and product warranty.